The Bureau of Reclamation has selected the construction of a third hydropower generating unit at Black Canyon Dam as the preferred alternative outlined in a Final Environmental Assessment and Finding of No Significant Impact. Black Canyon Dam is located on the Payette River about 30 miles northwest of Boise, Idaho. This is the first hydroelectric generating unit added to the Federal Columbia River Power System in over 30 years. The new hydroelectric generating unit was considered the preferred action alternative after a review of public and agency comments, and taking into account potential security and environmental impacts described in the Draft Environmental Assessment. Reclamation has determined that an Environmental Impact Statement is not required. The comment period for the Draft EA was June 27 through July 29. The two alternatives included: constructing a third generating unit, and a no action alternative. "This new generating unit will provide clean and renewable energy," Reclamation Commissioner Michael L. Connor said today. "The project will contribute to Idaho's economic health and create jobs for the region." A construction contract could be issued in late 2012. The new unit will produce an additional 10 to 12.5 megawatts, enough to supply about 9,360 homes. It is also designed for efficient use of water by generating power during high flow periods as water passes through the turbines rather than over the spillway, where potential power generation is lost. The $40 million construction project, funded by the Bonneville Power Administration, should start in 2013 and be completed in about two years. 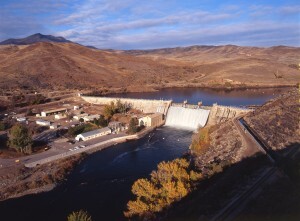 The FCRPS includes 31 federally-owned hydro dams on the Columbia and Snake rivers. Black Canyon Dam, built in 1924, is a multipurpose facility that provides irrigation, hydropower, and recreation.